Posted on Tue 11 Apr 2006 at 12:40 PM PST. Filed under Recipes. This is my Greek mom’s recipe for tzatziki, always a favorite among our family and friends. 1. Place in a large bowl all ingredients except the cucumber and start beating them with a mixer for about 3-4 minutes, until the mixture has become one. 2. Skin the cucumber and grate it into thin strips with a cheese grater. Add the cucumber and the mint leaves to the mixture and mix again for 30 seconds (with a spoon this time). 3. Serve as a dip. Put the rest in the fridge in a sealed container, it will keep fresh for a week. Tip: Every time you take it out of the fridge, there will be oil on the top of the mixture (it travels on top of the mixture all by itself). 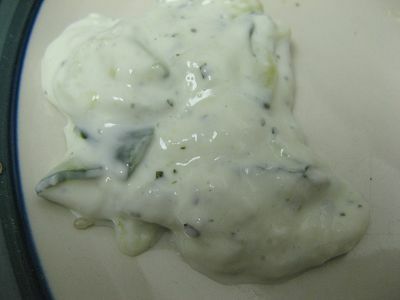 Before getting some tzatziki out of its container, just have a spoon ready to stir the mixture before serving.